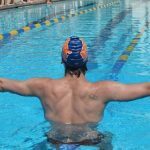 This swim camp offers a three-part curriculum that addresses all the key components essential for high performance technique across all four strokes. Plus, work on key performance details including starts and underwater dolphin kicking. Leading each session will be two-time Olympian and coach to Olympians Brett Hawke along with Jessica Long! All swimmers will learn a lot at this camp to become much stronger competitors. 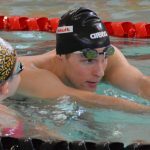 Brett and Jessica will lead 3 sessions for swimmers ages 12 and older. Each session will have a maximum of 36 participants. Sign up for one session, two sessions…. or enroll your swimmer in all three days for the ultimate learning experience! Scroll down for more details on the curriculum. FREESTYLE: Participants will reinforce the importance of holding a straight body line so that they can cut through the water with less drag. Practice keeping a still and low head position (especially during the breath!) while driving a strong flutter kick. Brett and Jessica will also teach participants how to get an early and powerful press backwards on the water in the arm pull to get more out of every stroke. From the 50 to the mile, your swimmer will learn skills that will allow them to drop time in every freestyle race. DIVES: How you set up on the block including proper hand and foot placement can allow your swimmer to explode forward with a lot of explosive power. Brett and Jessica will work with each swimmer to find their best position on the block as well as how to launch their body forward into a tight streamline and enter through a small hole.